We believe in the right of all disabled learners to access and be supported in mainstream education. We campaign for inclusion and against policies which exclude disabled learners from the mainstream. How does inclusive education work? 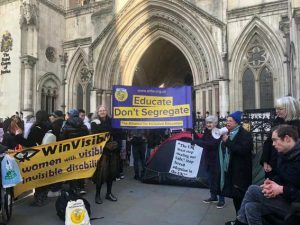 ALLFIE is supporting a case by campaign group SEND Action – Disabled Children versus Chancellor of the Exchequer & Secretary of State for Education. This case centres on the lawfulness of government cuts to SEND provision and their impact on inclusive education. We would welcome your support at the court on 26th – 27th June, so put this date in your diary. More details to follow. In January we turned out in force at the High Court to back a family’s battle for their child’s right to support in mainstream education. This is very much a human rights case. We are now awaiting the judge’s decision on whether the local authority’s policy of delegating responsibility for employing support staff to individual schools is lawful. ALLFIE’s concerns were cited in arguments. ALLFIE's work is more relevant than ever today. Help us continue our vital campaigning work. Inclusive education is the basis for lifelong equality of Disabled people, and a core part of independent living. We work with a network of Disabled People’s Organisations to raise awareness and engage locally around education issues, providing resources and training. Our oral history project: watch, read and listen to Disabled people’s experiences of education over the last century. Includes schools resource packs and more. Is your secondary school accessible? Join our research into school accessibility plans and tell us about your experiences. By law, schools should make accessibility plans to enable Disabled children and young people to access school facilities and make the most of their education. We’re running focus groups and surveys with parents, education professionals and Disabled young people to establish how well these plans are working.